Mince meat pie is one of my favorites, although it’s not all that popular anymore, having been replaced at the holidays with pumpkin, sweet potato and pecan pies. I made a mince meat pie a few years ago and I think my dad and I were the only ones who had any. Although the name is deceptive, mince meat doesn’t always contain actual meat. Some recipes do call for beef suet (fat), and some even call for venison, but modern recipes contain fruit and nuts (raisins, currants, prunes, walnuts, pecans, etc). The making of mince meat in modern recipes calls for brandy or whiskey. Mince meat was originally an entree in the middle ages, but with the sweetening from the fermentation of alcohol and the sugars within, it became more of a dessert. It was popular but saw a resurgence in the 19th century as the Victorians made it a yuletide dish. One medieval recipe included a Royal pastry recipe made from butter, egg yolks and flour, so it clearly was intended to be served in some sort of pie or pasty. You can consider it much like a preservation technique – most 19th century recipes for mince meat have it set for two weeks prior to use. By that point, all the contents are completely pickled in the alcohol. Often, people confuse mince meat with minced meat – which is in fact, meat cut very finely. This recipe is interesting to me and I think I’ll make it. The cookies might turn out like a raisin/nut cookie and might be pretty good. I’d try those! Unfortunately, the only mincemeat I have in my cupboard is a package of dehydrated mincemeat that I couldn’t quite pull the trigger to make this winter. Sounded way too processed. Do you make your mincemeat from scratch, Martha? I know…really late here….BUT the dehydrated mincemeat IS the type of mincemeat you use for this recipe. (technically, it is called “condensed” If you will look on the side of the box, you will find the exact recipe listed above. (although they have changed it from 3 1/4 cups sifted flour to 3 cups unsifted. This is the “must have” Christmas cookie in my house. I haven’t made mince meat but the various recipes I’ve found seem very straightforward and I’ll probably try it at some point. Basically just chop up a bunch of raisins and score the currants, chop the nut meats, combine with brandy, spices and sugar. The mince meat I used in the last pie was a jarred version from the local grocery and it was a bit strong on the molasses or something. Had a tarry finish I didn’t care for. Laurie, you could try the recipe at Joy of Baking – one of my favorite baking sites. I have the whole scene of “the making of the mince meat” from “State Fair” going through my head. The prim and proper mom was NOT going to add brandy to her crock of mince meat that she was going to enter at the fair. She thought better of it and poured some in. Her husband, knowing his prim and proper wife would NEVER condone adding alcohol to her recipe, adds some. During the judging at the fair all the prim and proper judges sample a little spoonful of each of the crocks, but their eyes get very wide when they sample our heroine’s. They keep coming back for additional helpings. She wins the blue ribbon! And if I’m not mistaken one of the even more prim and proper lady judges gives a little tipsy hiccup after presenting the ribbon. Is the best State Fair in our state! Now I’m gonna have that dopey song stuck in my head until some other dopey song comes along to replace it…. 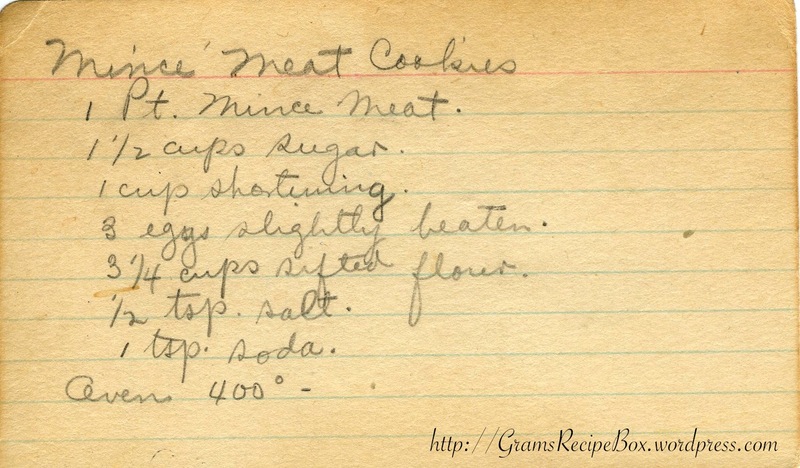 Mincemeat cookies are wonderful and I’ll have to try this recipe as I’ve lost my mother’s. The Dehydrated actually makes better cookies than the jarred. Thanks for posting this recipe! This has been a family holiday cookie all of my 60 plus years. Very labor intensive, 2 to 3 hours per batch by without help. Came from Rome, NY area from Mrs. Peiffer Will make it every year and am passing it on to younger family member. Mom always made these when I was a child. Loved these cookies. I never made any because I couldn’t find “the kind in the box.” Where would I find the dehydrated mince meat?